Home / enterprise / How to / tutorials / How to setup APN in 3G data card? How to setup APN in 3G data card? APN stands for Access Point Name. APN used to access the internet with predefined network. It tell the computer/device which network it has to use to connect the network. Let me show you quick demonstration to setup APN of 3G data card. Options and GUI (Graphic User Interface) may vary from device to device but the core part will remain same in all the devices. Step 1. Find Profile Management option in your software. 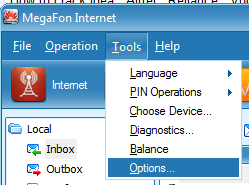 Here its available under the Tools > Options. Step 2. You'll gonna need the credentials of APN from different network provider. Below list are for Indian users only. If you are from out of India or APN settings not working then you have to call your network provider for APN ( Access Point Name ) and Access Number. Step 3. Create new Profile for your network provider. Click on Static and Provide APN ( Access Point Name ) and Access Number. Save the profile and close the popup box. Enjoy your internet connection by clicking connect.